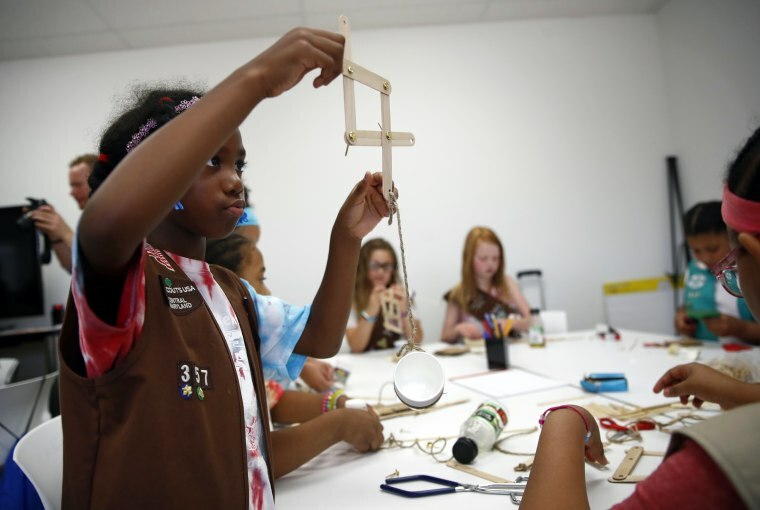 Girl Scouts from tiny Daisies to teen Ambassadors may earn 23 new badges focused on science, technology, engineering and math. It's the largest addition of new badges in a decade for Girl Scouts of the USA. The effort takes a progressive approach to STEM and also nudges girls to become citizen scientists using the great outdoors as their laboratory. Among the new badges are those that introduce kindergarten and first graders to the world of robots and engineering. Scouts can learn basic programming and build prototypes to solve everyday problems. Older scouts will have the chance to enhance those skills, learning more about artificial intelligence, algorithms and how to formally present their work. Other new badges focus on race car and aviation design using kits from GoldieBlox, a girl-focused toy company. The "leave no trace" approach to interacting with the environment and the study of meteorology by learning to predict weather patterns and potential hazards are among activities geared to new outdoors badges. Cayla Hicks, 7, is grateful. She's a Baltimore Brownie who's interested in the "Designing Robots" badge. "I want to be a scientist. I like building things and I like discovering things. Me and my brother — well, I usually ask my brother if he wants to look through my telescope. Usually he says no," Cayla said as she recently demonstrated how to make a "robotic arm" out of sticks and fasteners. Baby boomer Sylvia Acevedo, the CEO of the scouting group, was just like Cayla as a girl growing up in tiny Las Cruces, New Mexico. "My troop leader looked at me and saw me looking at the stars, and she taught me that there were constellations, she taught me there were systems and patterns to the stars," Acevedo said in a recent interview. "Because I got my science badge I developed that courage and that confidence to study science and math at a time when girls like me weren't studying science and math. Girls like me, statistically, weren't even finishing high school." Acevedo was one of the first Hispanic students, male or female, to earn a graduate engineering degree from Stanford University. The former tech executive's first job was as a rocket scientist at NASA's Jet Propulsion Laboratory in California. The new badges, some of which were requested by scouts themselves in a survey, are available starting this week. Next year, another initiative will allow Girl Scouts to earn "Cybersecurity" badges. One study cited by the scouts showed women remain vastly underrepresented in that industry, holding 11 percent of such jobs globally. Another study, done by the Computing Technology Industry Association, found that 69 percent of women who have not pursued careers in information technology attribute their choice to not knowing what opportunities are available to them. As for STEM overall, Acevedo said, a lot of girls remain vulnerable to a crisis of confidence in pursuing education and careers in those fields. "A lot of girls haven't made that shift from using technology to, 'You can actually be a programmer,'" she said. "That you're the one who can make that coding. For a lot of girls, they need to have that hands-on experience so they feel confident." The scouts, which are 1.8 million strong in the U.S., has offered such opportunities in the past but consider the new badges and related programming a major push. "It's really all about how do we capture that interest in science and technology," Acevedo said. "The other thing is the girls are learning not just how to do a specific skill but also how to think, how to think like an inventor, how to think like a creator, how to think like a maker. Those are the types of things that we want to ignite in the girls." Jennifer Allenbach, the scouting group's vice president for "girl experience," oversaw development of the new badges. Exposing girls to STEM by second grade is crucial in motivating them to continue, she said. As for the outdoors, the strategy is to move girls forward to dig deeper into such issues as conservation. "Girls had a say in this," she said. "We reached out and asked what they were interested in and this is it."